A group study that gives students a vision for life after uni, with session videos, participant’s workbook, and leader’s guide. It’s a jungle out there. An awesome, beautiful jungle. Most students leave university in a flurry of exam sweat, half-packed boxes, and last hurrahs. That is, without a lot of spiritual preparation. Instead, we plunge into the working world believing a lot of myths: that God is mostly for church and quiet-time, that business means business, that we have ‘one true calling’, and that we should have it all together. By laying out biblical mindsets and practical steps for whole-life discipleship, Routed breaks those myths down. It’s the ultimate prep for life post-uni. 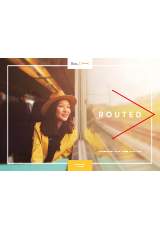 Routed – a collaboration between LICC and Fusion – can be led by students or student workers and includes Bible study, discussion, activities, self-reflection, real-life stories, and prayers. 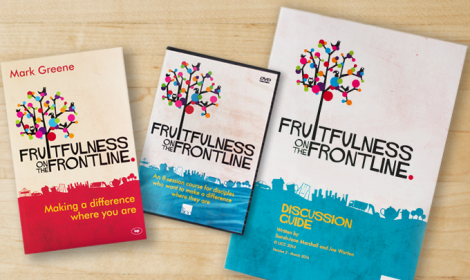 These are delivered in a participant’s and a digital leader’s guide, accompanied by session videos. Its four sessions are designed as regular gatherings during a single university term. Each session takes about 90 minutes. Prepare for the move from uni to work by recognising God's presence in and purposes for your day-to-day frontlines. Connect your future job(s) with God's creative and restorative purposes in the world, whilst considering how your life is a 'work in progress'. Gain a self-aware, service-oriented understanding of 'calling', and begin to address practical questions around job applications. Explore the key life changes connected to leaving uni and starting work, and learn how to bring these changes to God. Each member in your Routed study group will need a Participant’s Workbook. They contain session outlines, discussion topics and questions, activities and fill-in charts, key summary points, prayers, and a ‘for six months later’ section with follow-up reading and reflections. 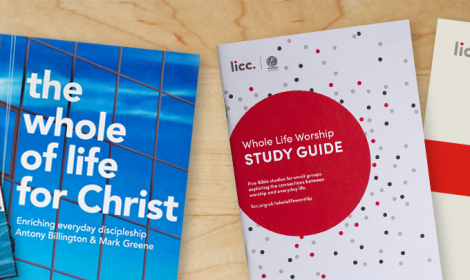 Purchase Participants’ Workbooks in packs of five for £10, or ten for £20. This digital guide contains everything in the Participant’s Workbook, plus helpful introductory pages, a guide to each session explaining themes, and ‘leader’s notes’ boxes to help you understand the flow and guide conversations. Get access to the full version below. Enter your details below to download the full Leader's Guide. By sharing your details you agree to receive a monthly round-up email from LICC – our best content direct to your inbox, and occasional personalised emails too. Already receive our emails? No problem. Just enter your details below. View the videos for each session below, you can also download them via the links provided. Presenters Nell and Adnan discuss their first few years after uni. Dom teaches from Colossians 1 on Jesus' lordship over all aspects of our lives. He reflects on 'frontlines' and how God works through us. Chris, a financial services executive and businessman for 40 years, shares how he had to shut down a business, and do it in a godly way. Nell and Adnan discuss how much time we spend working. Lindsay shows us God as a worker – and delegator – in Genesis 1, 2, and 3. They explore how our work in Christ, as humans, is to be creative and restorative. Dom, a trainee teacher, examines the pressures he and fellow graduates face – expecting everything to happen instantly, and the desire to measure themselves against others. Nell and Adnan discuss what we think of when we say ‘calling’ and look to Lindsay as she explains that, first and foremost, God calls us to himself. They discuss how that realigns their view of career and calling. SJ, an art teacher and new mum, talks about her varied career path and how her identity in Christ grounds her in all her work. Nell and Adnan discuss how they feel about change. Dom points to Jesus’ incarnation and life on earth as reassurance that our unchanging God experienced and understands change. Charles, a spiritual director, discusses life changes and shares a practical spiritual discipline for facing and praying through change - express, embrace, and entrust. 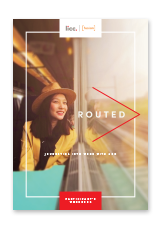 Keep an eye out for Launched, Routed’s sister resource, a group study designed for freshers on whole-life discipleship at uni. Launched is coming July 2019. Sign up below to be notified when it arrives.